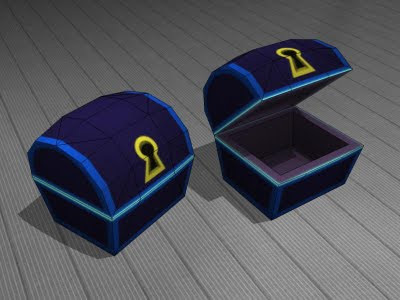 Here is this month's Kingdom Hearts II treasure chest papercraft. This chest is from the Space Paranoids area of the game. Space Paranoids takes its name from a fictional video game created by the character Kevin Flynn in the 1982 movie Tron, and as such, the area in Kingdom Hearts has much the same look as the movie. The template for the treasure chest may be downloaded here. 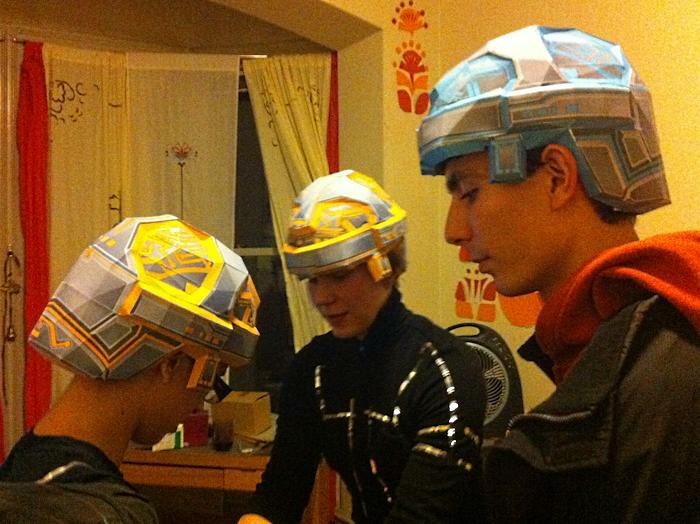 As an interesting side note, a fully functioning Space Paranoids game as seen in Tron may be played online at spaceparanoidsonline.com. 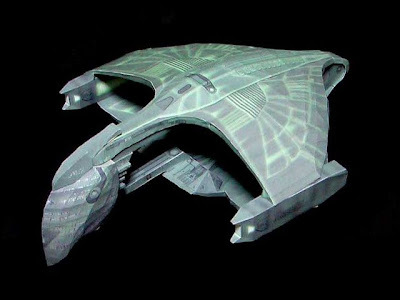 The D'deridex-class Warbird starship of the Romulan Star Empire first made its appearance on the Star Trek: The Next Generation television show. According to Zosho, the creator of this paper model of the ship, the Warbird is a large, heavily armed starship equipped with an excellent cloaking device. Zosho painstakingly created the template for the Warbird with Adobe Photoshop. All thirteen of the pages of the template may be downloaded here. The 1993 PC game, Day of the Tentacle, is a sequel to the 1987 graphic adventure game, Maniac Mansion. The villain of Day of the Tentacle is a purple, sentient tentacle appropriately known as "The Purple Tentacle." 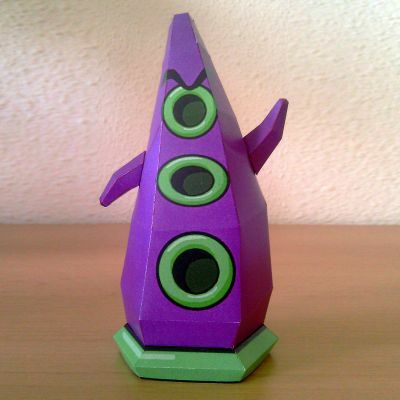 The Hellforge gaming website began offering this Purple Tentacle papercraft back in 2009. The download for the Tentacle works well enough, but on my computer at least an error message pops up when attempting to open the RAR file. But by ignoring the error message and proceeding anyway, I was able to extract one of the two templates. The build photo above is by Destro2k. UPDATE: As of 5/1/2011 the Hellforge website is down. Destro2k has graciously provided the template for those who are interested. Just click on the link above to his DeviantART page then look for the "download file" link in the upper right hand corner. The Team Fortress series of video games contain over 100 different hats that may be placed on the playable characters. This particular hat is called the "Scotsman's Stove Pipe." DeviantART member Fractaljinn has created an enormous papercraft version of the Stove Pipe (think the size of Johnny Depp's Mad Hatter hat in Tim Burton's Alice in Wonderland). The template for the hat (Pepakura PDO format only) may be downloaded here. UPDATE 10/14/16: The original top hat pictured is no longer available. 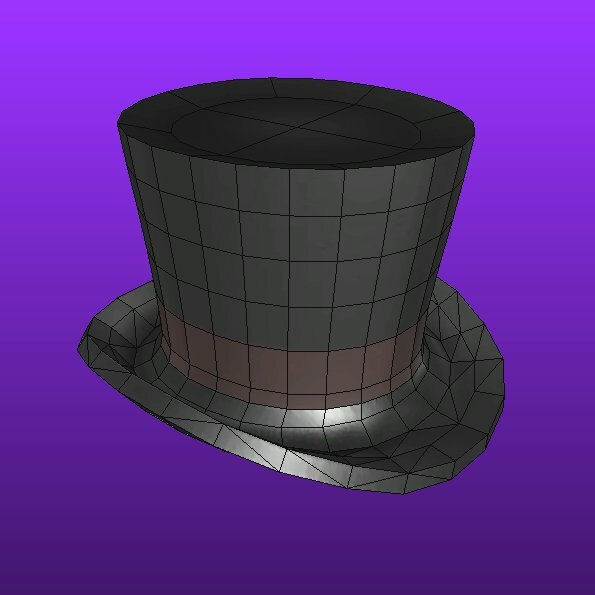 The link in the post above is for a download of a similar papercraft top hat. 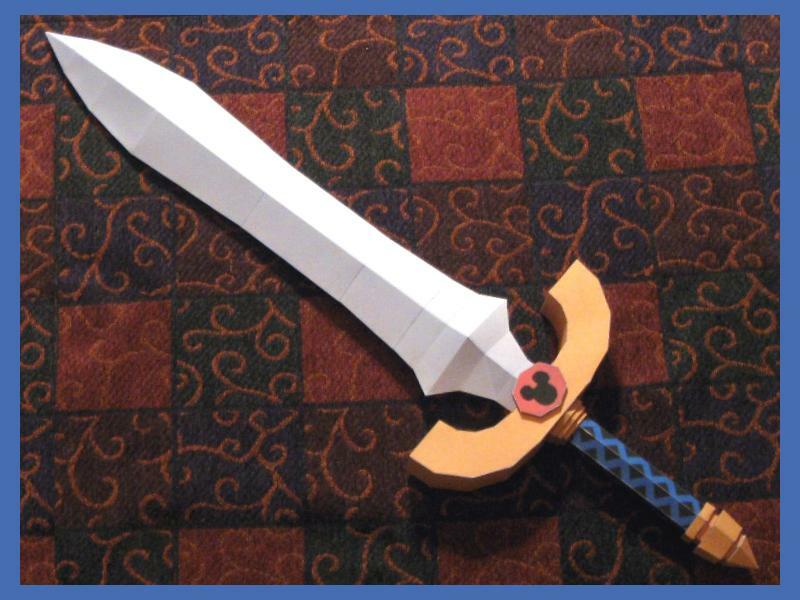 Another Kingdom Hearts II papercraft is complete! The Dream Sword is one of three weapons (along with the Dream Rod and the Dream Shield) that may be used in the "Dive to the Heart" area of KH2. This paper model Dream Sword is 1:1 scale and measures 36" (92cm) long. The finished model is more than sturdy enough for display purposes, but if you want to use it for something more active like cosplay then it will need to be reinforced inside with a material stronger than cardstock. The template for the sword may be downloaded here. This zombie paper toy has a backstory... Bobby died in 1986 on Friday the 13th at the annual ax throwing contest in his country. Each year he rises from the grave to haunt the contest. His shirt proudly proclaims his joy of non-living. ^^ The template for Bobby Zombie is available here. 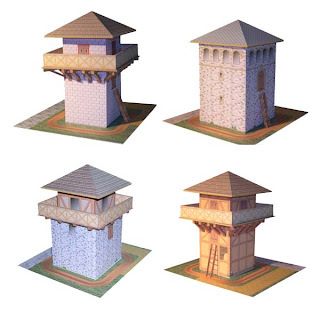 These paper model towers are recreations of what military watchtowers may have looked like in different regions of the Roman empire. The distinctive style of each tower is based on research into archaeological evidence by the creator of the models, Hans-Dieter Richter. The four watchtowers shown are a sampling of the eight different towers available. Template downloads can be found on Richter's web pages here and here. Bonus papercraft models to accompany the watchtowers include palisade walls and a small horse drawn wagon. Considered by many to be one of the better science fiction movies of the late 80's, Robocop tells the story a terminally wounded Detroit police officer who returns to service as a cyborg. 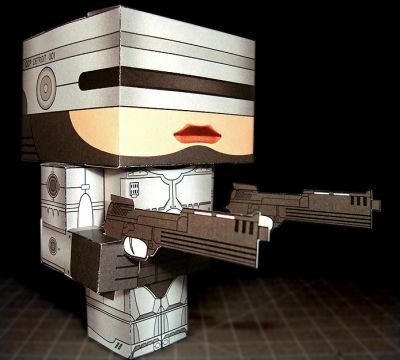 This cubee paper toy is Randyfivesix's take on the silver crimefighter. The two page template for the toy is available here. Knowing that Mother's Day is coming up soon, these origami roses caught my interest. Apparently there many different types of origami roses. The ones in the photo are what are known as "Gift of Gift's" roses. 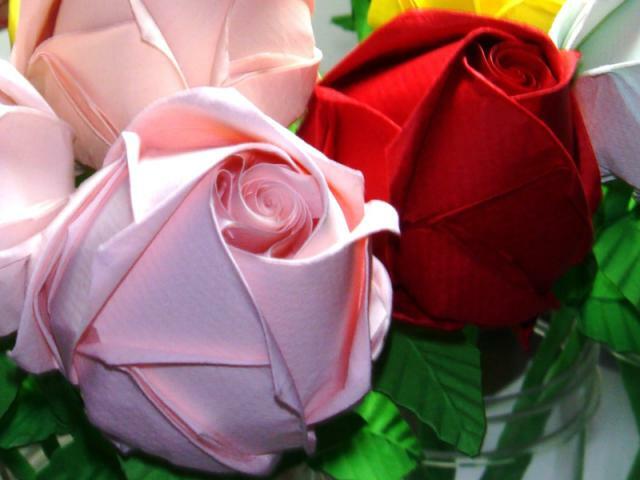 According to the creator of the roses, each rose is folded from a single square of paper with the folding process taking around two hours to complete. Excellent photos and numerous links to videos of the folding process are provided on the creator's Flickr page here. "Frag grenades are ideal to kill or disrupt large groups of low-ranking infantry (Grunts and Jackals especially), to blast an advancing horde of Combat Forms and Infection Forms, or to distract enemies as you beat a hasty retreat to cover..."
This papercraft is based on an actual 3D model from the Halo 3 video game, but I modified a couple of things to make it more reasonable as a paper model. First, I scaled the model way down to make it fit the size of an average person. The height of the finished model is 6" (15 cm) while the original 3D model size was around 8" (20 cm). 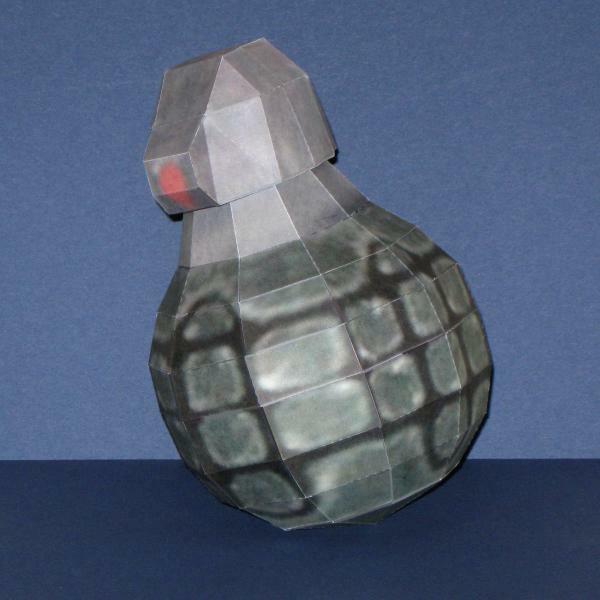 Second, I lightened up the textures on the grenade because I found the original textures printed too dark and became indistinct. 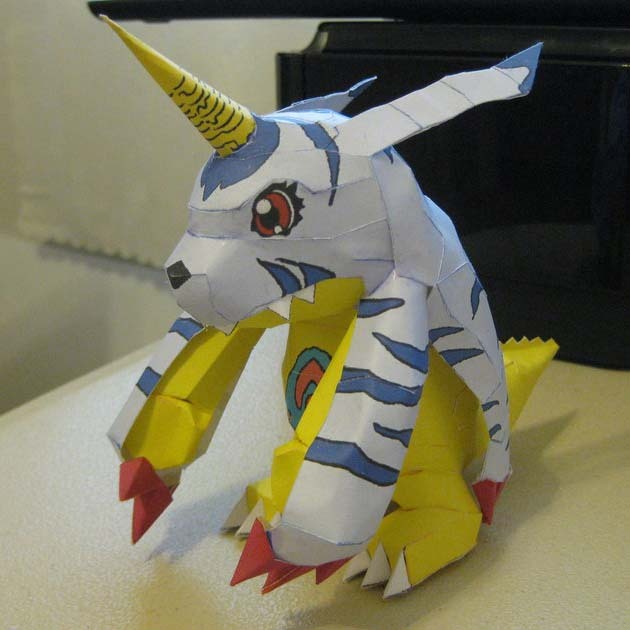 I may do more Halo papercraft in the future, but I have several other works in progress I want to get done first. The template for the model may be downloaded here. 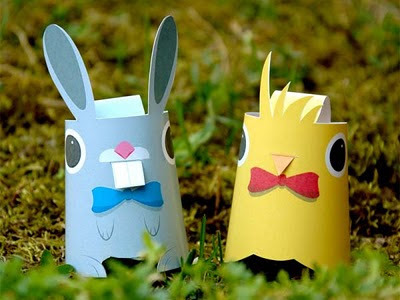 It's the time of year for cute bunny and chick paper models. :) These easy one piece Easter paper toys are offered on the Hungarian website, scamp.hu. Each toy consists of a single piece with only one glue tab. I like the simplicity of the design! A download of the template for these is available here. One of my favorite animals in the Star Wars universe is the tauntaun. Tauntauns first appeared in Star Wars: Episode V - The Empire Strikes Back. In the film, rebel soldiers take to riding the beasts on the ice planet of Hoth when the weather proves too cold for their vehicles. This tauntaun paper model was created by Sukhoi Noturna who based his papercraft on a 3D model from the Star Wars: Battlefront II video game. 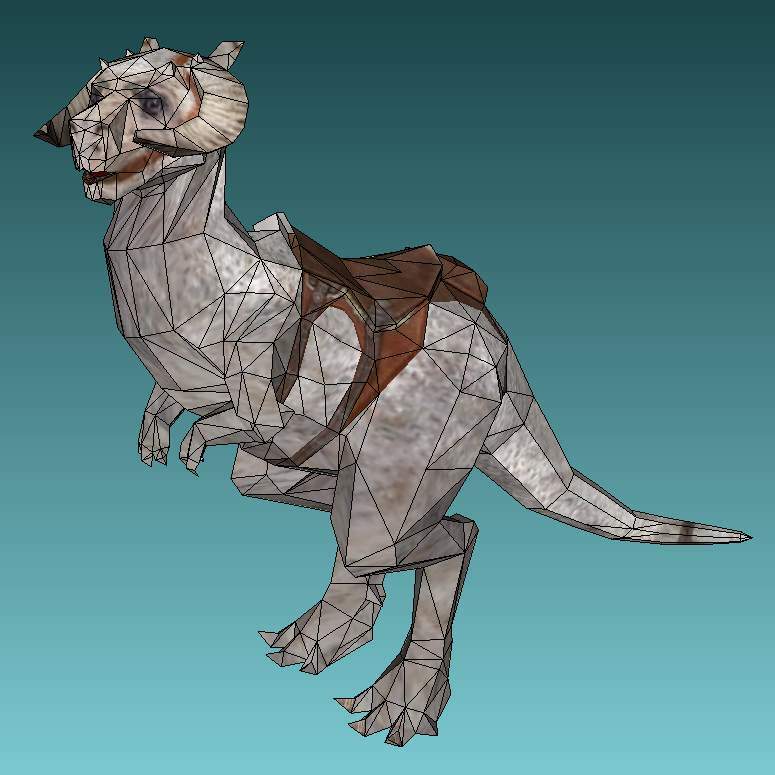 The zip file download for the tauntaun includes both PDF and PDO templates as well a separate template for a rebel soldier model that fits on the tautaun's back.